Notes: Turner A57. 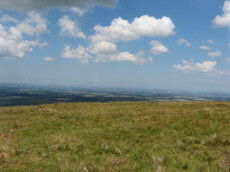 One of 4 cairns on Corn Ridge - see Turner "Ring Cairns, Stone Circles and Related Monuments on Dartmoor" DASP No. 48 p59 for diagram of the 4 cairns. This one is a "tor cairn" - a circular bank enclosing a rocky outcrop. The circle can be seen clearly on Google Earth satellite imagery. Notes: Turner A14. 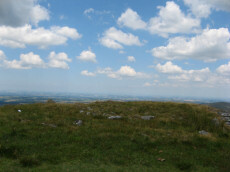 One of 4 cairns on Corn Ridge - see Turner "Ring Cairns, Stone Circles and Related Monuments on Dartmoor" DASP No. 48 p59 for diagram of the 4 cairns. This ring cairn can just about be seen in the photograph that accompanies this record, it is a bit difficult to capture in a photograph. It is a bit of an indistinct circular bank. It is perhaps easier to see in the Google Earth satellite imagery - which can help to then make sense of the photograph. Notes: Turner F2. 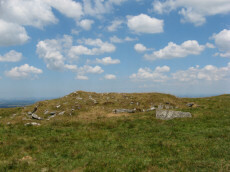 One of 4 cairns on Corn Ridge - see Turner "Ring Cairns, Stone Circles and Related Monuments on Dartmoor" DASP No. 48 p59 for diagram of the 4 cairns. Notes: Turner A66. 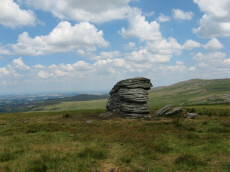 One of 4 cairns on Corn Ridge - see Turner "Ring Cairns, Stone Circles and Related Monuments on Dartmoor" DASP No. 48 p59 for diagram of the 4 cairns. "Tor cairn on summit of Corn Ridge. Two banks of small to medium stones associated with large outcrop. Outer bank survives as 12 metres long, 1.2 metres wide, 0.3 metres high curving rubble spread following s + w edges of the outcrop. Inner ring measures 1.3m wide, 0.3m high and corresponds with the n edge of the outcrop, but also extends over the rock itself, which stands 3m high. Area enclosed by ring banks measures 15m ns by 12m ew"
Notes: NMR B. Turner A33. "ring cairn surviving as a circular bank 4m wide and 0.7m high surrounding an internal area measuring 12m in diam. Four small hollows in the ring bank suggest partial early excavation or robbing"
Notes: "The remains of a cairn, SX 54608942, which has been disturbed in the past - now heather covered. Diameter 10.5m, height 0.5m. One or two stones of the retaining circle are still visible but there is no trace of a cist to be seen."